The seventh European Handcuff Convention - EHC2019 - will take place this year once again in Herborn, Germany, on 4-6 October 2019. Similar to the previous conventions the main meeting will be all day on the Saturday, 5 October 2019 this time. It is planned to be the usual combination of tables onto which you can place your items, talks on the topic, and ample opportunity for informal discussions. 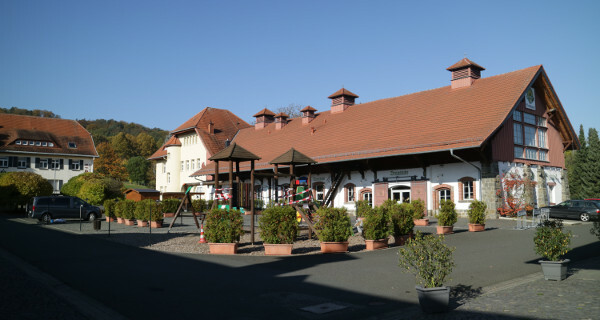 It is taking place in the Gutshof Herborn, a location which offers overnight accomodation, restaurant, and a convention venue. Hotel rooms at the reduced convention price can be booked - only by phone or email - until end of August. The venue can easily be reached by car via Autobahn A45, by train to railway station Herborn (1.5 km away, local buses ~0.5 km). Nearest airports are Frankfurt and Cologne. Send an email as soon as feasible to ehc2019 (a) haelden.de but no later than 26th September 2019. Please write me even if it is a "maybe" only at this point in time so myself - and fellow organiser Peter Pensaert - already have a way to contact you once further details are emerging. In any case this will put you on an email list for further information. Having said that, discounted room rates can be obtained by mentioning "EHC2019" or European Handcuff Convention. You need to book until end of August. Rooms available from 4/10/2019 to 6/10/2019, single price is 74 EUR per night, double price is 94 EUR per night. Price includes breakfast. Only book by phone or email, otherwise you won't get the discounted room rates. The general feeling from all conventioneers was that EHC2017 was a success. Not the least because restaurant, hotel and convention room at the Gutshof Herborn site were so close. Hence one could talk and chat not only during convention time proper but also at the breakfast table, at lunchtime, and in the evenings in the restaurant over some glasses of beer or wine or rhubarb juice.